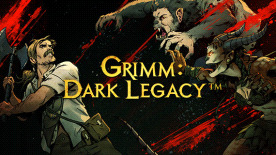 Grimm: Dark Legacy is a tale of deep, dark exploration, hunger, and blood thirsty combat in a medieval setting. You play the ancestors of the Grimm. Your story takes place inside the Wesen journal featured in the hit NBC TV series. Hunt, gather, craft, and form a ruthless band of Grimm to defeat humongous hordes of Wesen on your journey. Can you survive? Build your own rag-tag team of up to 4 Grimm and work together to raid each country and deal out Grimm justice to the mayhem that lives there. The beautiful game world is inhabited by a coterie of fauna and flora that you need to survive. Each level is generated in real-time meaning there is no end to the unforgiving combinations of blueprints, Wesen, and other mysterious creatures out to get you. Collect loot and craft new gear to survive as long as possible. Death is inevitable, but it isn't the end! Pass your knowledge on to the next generation of Grimm and continue your adventure! All Wesen in the game are drawn directly from the TV show and are imbued with a range of powers that make hunting them a real challenge. ©2016. Grimm and Grimm: Dark Legacy and their respective logos are trademarks and copyrights of Universal Television. Licensed by Universal Studios Licensing LLC. All Rights Reserved. Software ©GamesCo Limited 2016.